Having finally ended their three game losing streak last week against the Carleton Ravens to be 3-3, the Golden Hawks needed at least one more ‘W’ in the win column to give themselves a shot at making the playoffs. That win was secured in a 39-24 win on Senior’s day which was also a school day game, over the Windsor Lancers. While on paper, this may have seemed like an easy game for Laurier to win, it was not all that easy for the Golden Hawks the whole game. The first quarter was all about the run game, led by Levondre Gordon who had 90 yards in that time, including a 36-yard touchdown breaking multiple tackles and showing off his speed to put Laurier up 10-0. After going up 13-0 early in the second quarter, the Lancers picked it up. The defence stepped up, containing the Hawks’ run game as their offence came to life. Quarterback Sam Girard led Windsor on three scoring drives, 2 of which were passing touchdowns on his behalf that allowed them to go up 19-15 at half. Going from a fast start to giving up a lead is not a new narrative for the Golden Hawks this season. Fortunately this time around, that didn’t turn out to be the case. In a crazy sequence, Laurier took the game by the throat. After a fumble by Levondre Gordon at about the midway point of the 3rd quarter, the snap went over the head of Sam Girard on Windsor’s first play of the drive and into the end-zone as he recovered it which was a safety for Laurier. On the next drive, Laurier went 68 yards on 4 plays and scored on a 19-yard Kevin Wong touchdown. Following that was a Marvin Gaynor fumble in the end-zone on the kickoff that Esson Hamilton of Laurier recovered for a touchdown to go up 31-19. 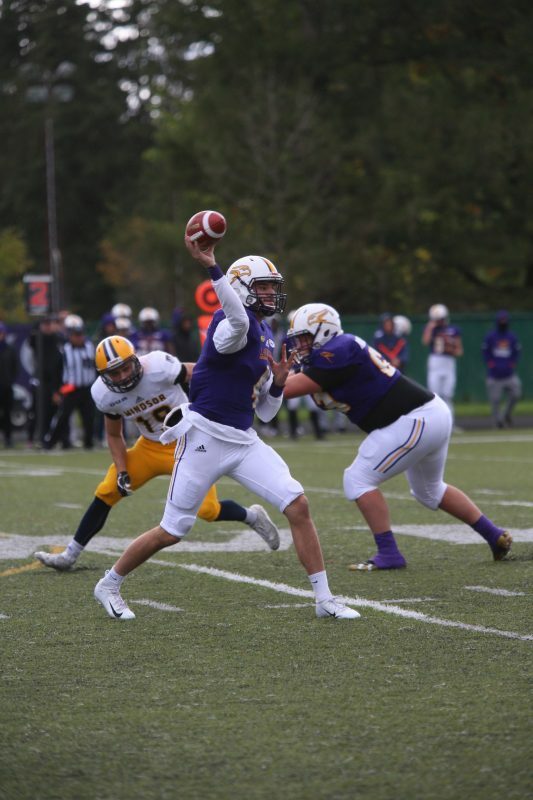 The Lancers never recovered and Laurier got their much needed fourth win of the year. Next up for the Golden Hawks is their biggest test of the year as they play the number one ranked team in the country, and rival, the Western Mustangs.